A lunch buffet to go from Hong Kong Express. My chopstick abilities are like my dance-floor moves — enthusiastic, but not pretty. Things get spilled. Even so, better to delve into some cuisines using the appropriate culinary tools rather than reinforce the image of the ugly, unlearned American by punking out and using a fork. One advantage: Chopsticks slow me down and force me to savor what I'm eating rather than simply shovel it in my gaping maw. And some foods — corn dogs, popsicles — have incorporated sticks to the point where any utensil is superfluous. For this section of Cheap Eats, be careful as you read; I probably dropped some things. When it comes to lunch buffets, there's a delicate balance between food quality and quantity; some buffet offerings are so bad that it doesn't matter how cheap the price. That's not the case at Spokane's HONG KONG EXPRESS (113 W. Indiana), where the prices are outstanding and the food is pretty damn good, too. For just $7.39, one can make multiple trips through a line of ever-changing Chinese dishes (for $7, you can pack a Styrofoam box with as much as you like, as long as you can close the lid). 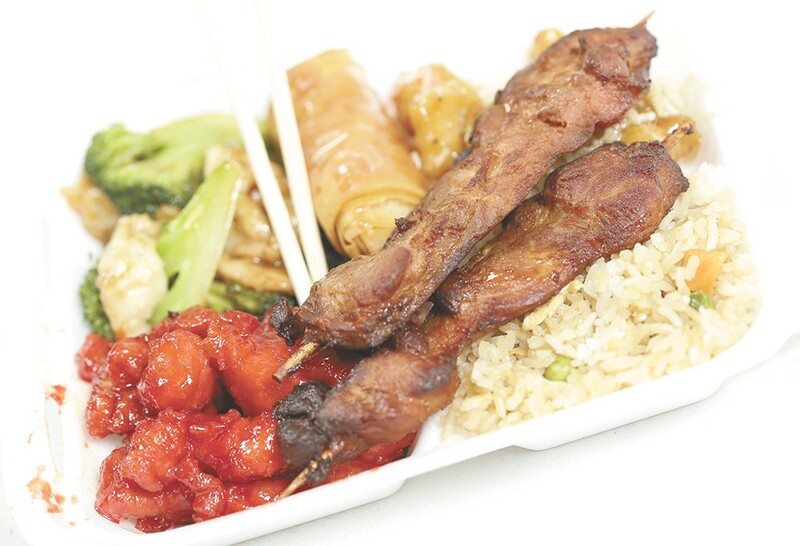 You'll always find a few basics, from egg rolls and egg drop soup to fried rice and Chinese-style chicken teriyaki. The sweet-and-sour chicken has a nuclear-red hue, and the orange chicken isn't too sweet. There are typically a few vegetarian options — although chicken seems the favorite ingredient here. You'll walk away full and not completely broke, and since the food is MSG-free, you can feel good about that second, utterly unnecessary plate. If you want something a bit more refined, SYRINGA (1401 N. 4th St., Coeur d'Alene) offers a good reason to pick up some chopsticks and dive into some excellent Japanese food. Like most spots serving sushi, it's easy to rack up a hefty tab, but you can easily keep the price under control with some strategic ordering at this stylish North Idaho spot. My go-to is the poke; the combination of diced tuna, seawood, soy, sesame seeds and togarashi (a Japanese chili pepper) is delivered inside a ring of creamy avocado oh-so-thinly sliced, and two people can easily share the poke and be satisfied, especially if you pair the $12 dish with some gyoza ($7), edamame ($3) or miso soup ($2). It's easy to spend a lot of money at QQ; the diminutive shop has a lot to offer. There's also plenty for diners on a budget, since one of their delicious rolls like the salmon, tuna and yellowtail-based Rainbow ($11) or Rock'n ($11), yellowtail slathered in spicy scallops and avocado, are a meal unto themselves. And at lunch, the $6.50 specials include curry chicken, sweet-and-sour chicken or General Tso's chicken, all served with rice and soup. Inside the charming refurbished house, you find an interesting combination of bakery and Thai restaurant. So if you're not craving a crepe or slice of quiche, break out the chopsticks for some pad Thai, Thai fried rice or roasted red pork over rice — all available for less than $10 at lunchtime. There are a lot of screaming deals to be found on the Gilded Unicorn's menu, with something for every taste, but you'll definitely want to try their sole stick-based delicacy, the wild shrimp corn dogs, served up with a spicy cocktail sauce and an apricot honey mustard for all your dipping needs. Tasty and satisfying, you get four for $11 on the regular appetizer menu, and you can order them one at a time for $3 a pop during happy hour. Serving up delicious fresh fish, Sushi Sakai offers plenty of sashimi, nigiri and sushi rolls for less than $10, making it a sweet deal. It's easy to blow out your budget on sushi, but Sushi Sakai's location near the Gonzaga campus and its new spot in Spokane Valley can fill you up without your back account feeling buyer's remorse. Want to keep things simple? Real simple? Forget all the futzing with buns and condiments endemic to a burger, and skip the fries. Go straight to the Zip's corn dog, yours for a mere $1.84 after tax, and as satisfying an all-American treat as anything you'll find on the menu at Spokane's favorite fast-food joint. Yes, you can add some ketchup or mustard, but that layer of deep-fried breading that's coating the dog and surrounding a stick doesn't need any help. The goodies available at this new ramen spot aren't strictly a chopsticks affair, but you'll need them. A mere spoon can't get at the noodles filling the bounteous bowls of delicious broth, nor gracefully grab the hard-boiled eggs and pork in every order. Then there are the appetizers — gyoza, seaweed salad and the like — that just taste better when using Japan's favorite utensils. Unsurprisingly, chopsticks find their origin in China, with the first evidence of their existence dating back to about 1200 BCE. Chopsticks were initially used for cooking and serving, but at some point during the Han Dynasty, which lasted from 206 BCE until 220 CE, they began appearing as eating utensils. Present-day chopstick design and the ability of the utensils to handle almost all solid foods did not come into existence until the Ming Dynasty, a period lasting from 1368 until 1644. Until then, rice and other grains were usually shoveled into the mouth with one's fingers.